One objective in starting a record of PNW losses was to “ground truce” the BeeInformed loss surveys. Both BIP and PNW surveys include the same general population of beekeepers (mainly commercial for colony numbers and hobbyists for individual numbers) and annual average loss percentages are computed the same way. In 1/2 of the states/years the numbers are in close agreement (under 5% difference) but curiously the most recent survey year results exhibits a considerable difference in average loss levels (8.5% or above). The BeeInformed average loss results for 2017-18 winter losses are 8 plus percentage points higher (for Washington) or lower (for Oregon and Idaho) than the PNW survey results. The table on next page includes the summary numbers of % loss, number beekeeper respondents, number colonies they maintained in the fall of the year and, in red, the difference in winter loss average between the two surveys. For the most recent BIP survey, 122 survey-returning OR beekeepers, with 19,232 colonies had an average loss of 24.8%. In the PNW survey, 319 OR beekeepers, managing 45,524 colonies had an average 15.9% overwinter loss. The loss difference is 8.6%. The BIP survey with a smaller number of beekeeper respondents and colonies managed reported higher estimated loss. In Idaho, the difference was a 8.9% reported loss difference. BIP survey of 34 individuals (managing 11,099 colonies) reported a 25.9% loss while PNW survey, of 21 individuals managing 52,010 colonies had a loss of 17%. As in Oregon, the PNW survey reported the lower loss level. BeeInformed and PNW survey results also differed by the same approximate margin for Washington beekeepers this past survey season but the PNW survey reported the heaviest loss rate. BIP winter loss rate was 21.4% (139 beekeepers managing 52,531 colonies) while PNW survey average loss rate was 28.4%; it included 24 fewer beekeepers managing 25,959 fewer colonies. The lower reported losses in Oregon and Idaho might be due perhaps to the PNW sample including a higher proportion of commercial/semi-commercial beekeepers with fewer in Commercials represented in Washington PNW returns. Commercial beekeepers in all 3 states typically have lower loses, by 50% or more, compared to smaller-scale beekeepers. 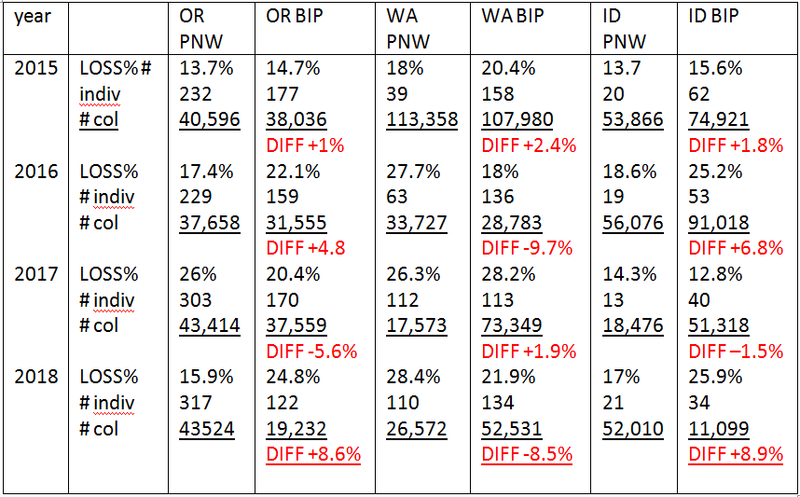 In Oregon and Idaho the colony numbers of respondents are greater while the reverse is true for Washington individuals and this too could have impacted the loss percentages. In three previous survey years, a large differential in average overwinter losses of the two surveys also was reported when there was a big difference in number of individuals or/or number of colonies managed by survey respondents. For example in the previous year (2015-16) survey) in Oregon, the BIP survey reported 5.6% lower loss level (the BIP respondent pool was 133 fewer individuals and 5855 fewer colonies). For Washington, there was a 9.7% difference in the two surveys in 2015-16 when the BIP survey, although including 73 more beekeepers, had 4944 fewer colonies. In the same year, Idaho loss differential of 6.8%; The BIP survey included 34 more beekeepers managing 3,942 more colonies. Why the most recent survey year differences are so different is not known. Generally the loss level numbers reported by the two surveys do “track” and if sample sizes are considered can be explained when the differences are over 5 percentage points. The OR and WA beekeeper small scale beekeeper survey respondents www.pnwhoneybeesurvey.com are mostly 1-4 colony holders but there are several that have 10 or more, up to 50 maximum, colonies. One question I get is what about the losses of these small scale beekeepers who have “larger” colony numbers – do they have higher losses? The short answer is NO. For WA backyard beekeepers, 40.5% had 1 or 2 fall colonies and 26% had 3 or 4. The Medium number was 3 colonies, simple average of total 104 WA beekeepers was 4 colonies/individual. In Oregon of backyard beekeepers, 61% had 1 to 4 fall colonies. Medium number was 3 colonies and simple average of 303 Oregon OR beekeepers was 4 colonies/individual. For the 2 PNW states, survey responses from 12 commercials (simple average 5826 colonies/individual), 11 individual semi-commercial beekeepers (average 128 col/individual) and 407 small scale beekeepers (simple average 4 colonies/individual) were respectively 19%, 28% and 40% overwinter losses. 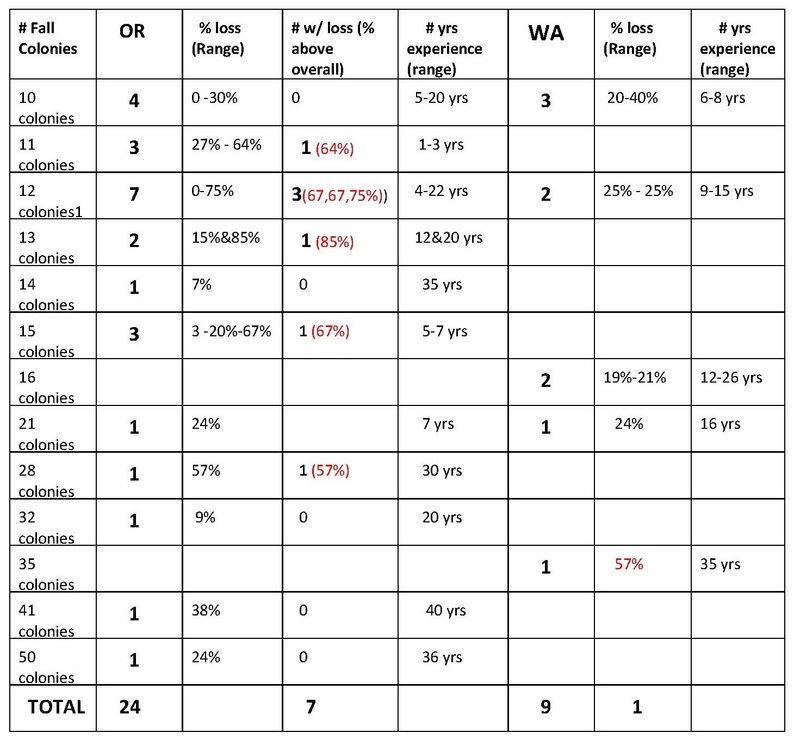 Table on next page shows number of individuals by fall colony size (10+ colonies), their loss percentage and their number of years of beekeeping experience. Losses in red are the 8 individuals with heaviest losses. It is clear that smaller scale beekeepers with 10+ colonies (up to 50) did NOT have higher losses compared to majority of the backyard beekeeper respondents in the two states.